Warning: This is an uncharacteristically long post for this blog, but it’s a topic that I am pretty passionate about: Helping companies better connect with their brand advocates and customers, and vice versa. If you’ve read this blog for any amount of time, you know how I often use the Rockstar analogy to explain how Rockstars have fans, while companies have customers. This post attempts to address this point, and provide a framework for how companies can better connect to their customers and advocates. And vice-versa, with the end goal being that both the customer and the company better understand each other, and the financial benefits that the business will enjoy as a result. The best post on social media that you have likely never read is this one from Hugh in 2005. In it, Hugh makes the case for corporate blogging (remember this was a year before Twitter was launched and the Goliath of the social media arena at the time was MySpace), and talks about the conversations that companies have internally, versus the one their customers are having externally. The idea being that a corporate blog makes it easier for the customer to bring their external conversation to the company, and the company can more easily bring their internal conversation to the customer. Ideally, both groups would become more closely aligned, as a result of better understanding each other. As the customer’s external conversation begins to be heard and understood by the company, then the company’s internal conversation changes a bit. And that change likely moves it closer to the external one, and in theory, as each group better understands the other, the two separate conversations will gravitate toward each other. This is what I was talking about in my post on the promise of social media for businesses lies in FEWER conversations. So I decided to come up with a process to do just that. This is rough and I’ll no doubt be editing it constantly as time goes by. To better understand what I’m suggesting, let’s look at a fictional B2C company, Carl’s Soda. CS is middle of the pack in a crowded industry, and like most companies, can tell you their customer demographics, but doesn’t have a lot of direct interaction with their customers. They have average customer satisfaction (avg to the beverage industry) scores, yet like most companies, do have their customer advocates. Though the company does little to engage this group. The majority of its marketing and advertising is done via traditional channels, with the pre-requisite experimenting being done online, especially with social media. In short, they are pretty much lost in the shuffle in a crowded industry. We want to see if we can change that by better connecting the company to its customers, and its customers to the company. As you’ll see as this process is fleshed out, it’s going to not only embrace and empower CS’s existing brand advocates, but cultivate new ones as well. This group will be responsible for not only monitoring online and offline product and company mentions, but for preparing findings and providing them to relevant departments within the company, such as marketing, PR, customer services, product development/design, etc. Additionally, this team will closely track changes in the volume of online mentions, as well as the sentiment. Responsible for internal education of customers and interacting with them online. As stated above, Carl’s Soda has its share of brand advocates, but really hasn’t done anything to engage them. That starts with this program, which will be invitation-only and cap membership at 100. This will give Carl’s Soda the ability to not only connect directly with its most passionate customers, but a mechanism to give them the tools to spread their love of Carl’s Soda to other customers. If you’re looking at an existing model to compare this to, look at what Fiskars has done in creating The Fiskateers movement. This would be a way for employees to learn more about each other, and share ideas and feedback. This would also give employees a way to give feedback on the working environment, and suggestions for improvement. Unlike the brand ambassador program, this should be open to any employees that want to participate. Similar corporate models could be Best Buy’s Blue Shirt Nation, or Dell’s internal IdeaStorm for employees. This will be a 6-person council comprised of 4 brand advocates for the company, and 2 customer advocates (who are company employees). The 4 brand advocates will be chosen from the membership of the brand ambassador program. The Brand Advisory Council will be over the Brand Ambassador Program. Will meet quarterly with key executives at Carl’s Soda to give them greater insights into the company’s customers and advocates. This will be a 6-person council comprised of 4 customer advocates (who are company employees), and 2 brand advocates, who are also members of the Brand Advisory Council. Will be over the internal social networking site for employees as detailed in Step Three. The Customer Advisory Council will be responsible for bringing the internal conversation that the company is having about itself and its customers, to its customers. This could be done via meetups, or even social media by highlighting employees and their thoughts via posts, video, etc. Will meet quarterly with key executives at Carl’s Soda to give them greater insights into the company’s employees and the internal conversation they are having about the company, and its customers. Now as I stated above, this is a rough draft and I will no doubt be altering this several times in the future. But the entire reason for this process is based on this truth: Participating in a conversation changes that conversation. This process is about finding a way to better align the external conversation that customers are having about the company, with the internal conversation that the company is having about its customers. A better understanding of its customers, which leads the company to more effectively and efficiently market to its customers. Which lowers marketing costs. As the company better understands its customers, and vice versa, customer satisfaction improves. As the company’s employees have a mechanism in place (internal socnet) to connect with each other and provide feedback on the company itself, employee satisfaction improves. Several times I’ve written here and elsewhere about how rockstars connect with their fans, and more or less have the same conversation. Some companies, such as Harley-Davidson, have many brand advocates, and as a result, the internal and external conversations aren’t that far apart. Harley-Davidson loves its products and brand for many of the same reasons its customers do. But many companies have difficulty with this because the conversation the company is having and the one the customers are having about the company, are usually quite disjointed. This process attempts to address that, and bring the two conversations more closely together. At the end of the day, companies cannot afford to ignore their customers any longer. Customers now have the tools available to them to mobilize and communicate with themselves far faster than the company can communicate on its own behalf. Recent PR trainwrecks like Motrin Moms and Kenneth Cole’s #Egypt tweets on Twitter attest to this. Companies have to not only be aware of what their customers are saying, but find a way to bring that conversation into their walls, and vice versa. This process helps them get started along that path. What have I missed? And there is a TON I have missed, trust me. Does this make sense? Again, it’s the starting point, the execution side hasn’t really been addressed yet. What would that look like? Loving this … but what do small companies do? How does a start-up or a biz with less than 20 employees make this happen? Is there a Cliff’s Notes version for small businesses that can’t afford to follow your thoughtful path due to do constraints of dollars and personnel? Dan that’s a good question. Obviously, it’s easier for big brands to connect with advocates and customers, simply because they have more and they are creating more content about the brand that can be measured and analyzed. From the point of view of a small business, I would advise that you still do the monitoring of company mentions that bigger brands do. I think the advantage for a smaller company is that there will likely be less ‘online chatter’ about your company, but then again, it will be easier to reply directly to customers on an individual level, whereas a bigger brand such as Dell obviously can’t do that as effectively. If you only have 5 ‘fans’ online, then you can still connect with those 5 people that are passionate about your company, and give them an incentive to each tell 5 more people about how amazing your company is. Then if you are aggressive in staying connected to your customers, the online chatter about your company will grow, but a greater percentage of it will be coming from customers that have likely connected directly with you, so there’s a much higher chance of their feedback being positive. So it might be a situation where Big Brand A might have 1,000 new mentions a day, and 65% are positive, where your small company only has 50 new mentions a day, but 90% of those mentions are positive. As that number grows it will be tough/impossible to maintain a 90% ratio, but it will be easier to keep it at a high level? Does that help? Simply doing basic monitoring and responding to individuals when you can, will work wonders. Thanks for the post, Justice. Interesting stuff. I love this philosophy and the steps you’ve outlined are a good start. My only cringe-point was the idea of the creation of positions and committees. It may simply be a matter of semantics. Perhaps if you said “dedicate resources” instead I wouldn’t have cringed so much. Head count is huge in my organization, and while you never used the word “hire” that was the impression I got. I do strongly believe that external and internal conversations need to be monitored as they hold great value. Of course, first you have to find out where those conversations are occurring. If it is in a soft spot (i.e. verbally during face-to-face events) then there’s needs to be a hard spot (i.e. Facebook) where they can be recorded in writing. Or maybe you create a hard spot for those verbal conversations to be recorded (a place for employees can note customer interaction and feedback)? Either way, brand advocates (internal and external) are extremely powerful and companies should do what they can to harness that power. Thanks for a great post! Siobhan that’s a good point on potential need to hire additional people. I think there’s a good chance that some hiring would be necessary, but I don’t think it would be across the board. For example, note that the responsibilities of the Customer Insights Team sounds curiously like the tasks performed by the social media departments at most companies. I think this is important because I believe in the coming years we are going to see a shift away from focusing on social media-specific positions and departments. I believe Susan Beebe’s role at Dell is Chief Listening Officer. Companies are beginning to shift away from focusing on the social media tools, to incorporating what they tools allow you to do, into all their business processes. So the long-winded answer is, I think a lot of the responsibilities of the Customer Insights Team could be handled by the company’s existing Social Media team, and as for the 4 employees for the Customer Advisory Council, they could likely be current employees as well. Perhaps as this process has been in place long enough to start showing real results, additional hiring could be done to support/expand its efforts. But I am envisioning that most companies could do this by utilizing existing employees, for the most part, and any necessary hiring would be minimal, IMO. Dan’s question was exactly my thought – not all the companies can afford such a big team for social media management. I more or less agree with the steps, but in some cases (probably most of the cases) SMM team might be down to 1-2 employees. In small companies i believe it is important for all employees to be aware of the SMM and engagement with the customers on-line. While a dedicated person can be the one implementing SMM activities and engaging with customers, all employees should be aware of its importance and of the fact that their personal behavior on-line is seen by customers as well. This can be done with internal social media training, with reporting on meetings on activities done / achieved through social media and so on. But their personnel needs will obviously be less as well. As I told Dan, you might only have a handful of online mentions a day to monitor, or maybe it’s a handful a month. IMO, that’s actually an advantage for a small business, cause you can probably provide each of those customers with a level of individual and customized attention that a big brand could never duplicate. In this case, I think your size is actually an advantage over big brands, and you should use it as such. I disagree with this quote. It sounds good but is divorced from the reality that the majority of business owners face. To be clear, I wholeheartedly believe in cultivating brand advocates. I know and have personally benefited from the power of social business. But, businesses can’t be lulled onto the rocks by heartfelt soundbites. They need to keep their eye on the goal. For a business, it’s sales. Brand advocates are an important ingredient but shouldn’t be confused with execution on a sales-focused marketing plan. I can easily see this quote being used to justify cool tactics that still suffer from weak messaging, shaky value propositions, and poor targeting. P&G can make this statement, primarily because their sales are assured. However small and medium sized businesses have to “close the deal” with brand advocates. Afterall, congratulatory tweets and healthy comment numbers doesn’t translate into payroll dollars. Thankfully, Mack, your post adds the context that this quote needs to halfway credible. Stanford that’s the beauty of this quote, what Steve’s really saying is that if you cultivate more brand advocates, that you will also be creating more sales. Satmetrix released a study last year where they found that advocates not only spend 13% more than the average customer, but they also refer business equal to 45% of the money they spend. But we know it from our own experiences, what is more likely to make us buy a product, if the company tells us how amazing they are, or if one of our friends tells us how amazing the company is? Obviously, the recommendation from a trusted friend is far more likely to make most of us purchase a product, vs marketing directly from the company. 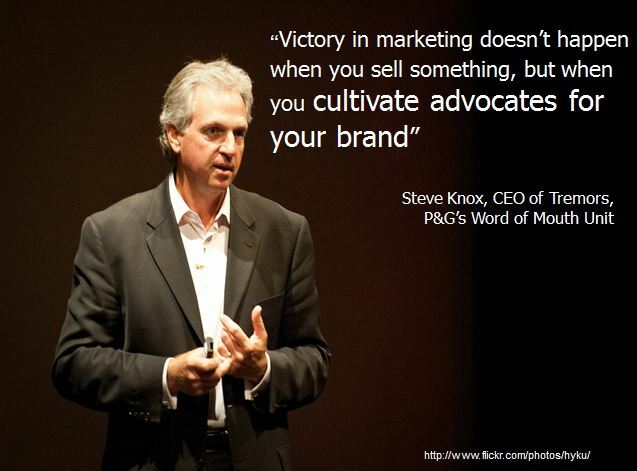 Steve’s quote takes into account that if a company can cultivate advocates, that they will, by extension, be cultivating sales. And they will be creating more effective and efficient marketing, because it will be coming from the company’s customers, moreso than the company itself. Mack, P&G should hire you. Best explanation of the “Brand is God” mantra that I’ve heard after 15 years in the business. A small, but important I think, point based on some of the comments here. First, I’d argue that small businesses in particular have an *advantage* where fostering advocates are concerned. By their nature they are more qualitative than quantitative thus their needs of scaling aren’t as complex as an enterprise. Second, advocacy *is* the means to scaling for all size organizations. I wrote a post last year on why that is, but won’t spam your comments with it here. p.s. – Thanks for attending my presentation on Influence and advocacy at BlogWorld last week. I selfishly hope it played a part in some of the mental and external dialog leading to this post. Matt I agree, the small business owner has a big advantage in connecting with advocates, who are often friends and even neighbors. Where as a CMO is hired into a company where they have no connection to the brand’s fans, and will likely be gone to another job in 6-18 months anyway. The level of connection feeds directly into the level of understanding, which creates an atmosphere where trust can exist, which leads to advocacy. And yes, your session at Blog World did indeed shape my thoughts, and please add a link to your post if you want. Excellent article. Creation of Brand Advisory Council is quite useful and I’ve often used it. The quote by Steve Knox was just brilliant. I read online that he’s retired from Tremor… couldn’t find a blog, do let me know if you know where he does write… (Looks like he now advises the Boston Consulting Group).